When the dust settled on Tuesday night at the United Center, the Blackhawks had lost to the Nashville Predators again. But this time, there were some positives fans could take away from the game. Excuses are for losers, but the Blackhawks could certainly make a couple on Tuesday. Consider that Nashville was arguably the hottest team in the NHL coming into the game (9-2-0 in January before last night’s victory), and had the hottest netminder in the league between the pipes. The Blackhawks countered that momentum by having two of the better scorers in the NHL, Jonathan Toews and Patrick Sharp, on IR and skated five rookie forwards who have combined to post 30 points in 96 NHL games. The Predators put on a defensive clinic through the first two periods, and the Hawks struggled to maintain puck possession (or, in many cases, even get the puck deep). Certainly both of the goals allowed in the first period left a lot to be desired from a number of players, and the Hawks weren’t able to put together any momentum through the first 40 minutes. For the first time since Jonathan Toews and Patrick Kane were rookies, the Blackhawks looked like a young team trying to fight a “big brother” team that was out-playing them with fundamentally superior hockey. But not everything was was negative. 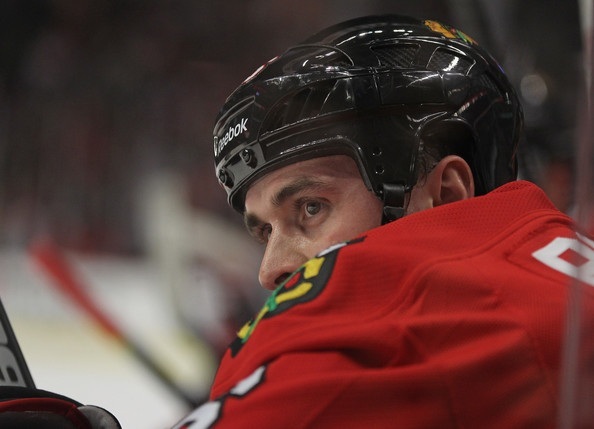 Dave Bolland had perhaps the best night of his career at the dot, winning 17 of 20 faceoffs. He also scored his 15th goal of the season, Chicago’s only tally of the night, on the power play in the third period. The Blackhawks played perhaps their most physical game of the season. Only four skaters on the Hawks roster weren’t credited with a hit in the game, and the team-high of three was reached by Steve Montador and three of the rookies: Jimmy Hayes, Andrew Shaw and Marcus Kruger. While the penalty kill has been a struggle throughout the first half of the season, it was very good on Tuesday night. If not for an empty net goal with an advantage by Colin Wilson with just 13 seconds left in regulation, the Hawks would have killed all three Nashville penalties on the night. Chicago was as good as they have been all season on the Preds’ first two advantages, and those were with primary penalty killers Niklas Hjalmarsson and Duncan Keith in the box. The toughest part of the loss was the performance of Corey Crawford in net. He was bad on Saturday night, and needed to be better on Tuesday night. He didn’t get much help in the first period, but needed to make a save on one (or both) of Nashville’s goals in the first period. But to Crawford’s credit, and in spite of rebound control that continued to be mediocre, he was much better in the final 40 minutes. He stopped all 16 of the Preds’ shots in the second and third periods, and made a couple big saves when the Hawks’ defensemen left him hanging. In total, Crawford numbers weren’t bad (two goals allowed against 25 shots, .920 save percentage), but this is a great example of how stats without context fail; with how well Pekka Rinne was playing on the other end of the rink, two goals was likely going to win the game and Crawford allowed that in the first 20 minutes. Without the empty net goal, the handicapped, rookie-heavy Blackhawks played to a 2-1 loss against one of the hottest teams in the NHL. While the league doesn’t award points in the standings for moral victories, and the Blackhawks aren’t looking for a pat on the back these days, that isn’t an overwhelming loss; indeed, the result on Tuesday night was a significant upgrade from the debacle in Nashville on Saturday night. On Wednesday morning, Ben Smith and Brandon Pirri were sent back to Rockford. The organization keeping Hayes and Shaw on the NHL roster over the Break is a strong indication that they’re in Chicago to stay. the Blackhawks looked like a young team trying to fight a “big brother” team that was out-playing them with fundamentally superior hockey. Why is it that this seems to be the norm for every game the Hawks play? At what point does coach Q get some heat put on him for all of this! Tab, I know what your saying, but I have some doubts that this loss was as “good” as we both hope. For one, Nashville played the night before and traveled and we hadn’t played since Saturday so our third period “comeback” was to be expected. Second, I noticed two gift penalty calls we received in the third period. One was a Nashville penalty for tripping Kane and I didn’t see a trip and then that elbow call on Weber. In my view, we have to add players to make a playoff run and I am concerned about whether we can do that with all the “buyers” and the dearth of “sellers”. I also don’t think Anaheim is selling from what I have been reading. And even if we do make a deal we are basically trying to replace Campbell(two defensive turnovers lead to goals last night) so it raises the question of whether he should have been traded in the first place. I realize he was being overpaid, but if the team isn’t as good as we were in last years playoffs, then whats the point. As things stand right now(injuries aside) I would rather have our team from game 7 in Vancouver. What do you think? A solid d-man definitely needs to be found. I like Leddy. I do. But he’s 20 years old and still finding his way. He’s just not reliable enough for when the playoffs arrive. Also, the Preds have always played this clog the neutral zone and pounce on the opportunities which goes against Chicago’s style which is using the neutral zone to create the rush. I do admit tho’…Pekka Rinne is at his best right now and thats a big wall to overcome. Last note: If Nashville doesn’t re-sign Shea Weber they’ve lost their minds. More and more I am beginning to edge a little closer to the ledge. With every game they play existing holes are taken advantage of and exploited in every manner possible or new holes are exposed. While he wasn’t exactly horrible last night Crawford needs to make a save on at least one of those goals. Judging by his reaction after the second of the night I would say that he agrees with me. However, in defense of Crawford, the D men need to play much tighter around their crease and maybe not be so careless with the puck. Is it too late for this team? Probably not if the right moves are made, of which, bringing back Campoli as I have heard reported is not one of them. If a solid D man is brought in to shore up the 2nd pairing and Leddy is allowed to play 3rd pairing minutes and Q either starts riding Emery like he should or Crow is able to regain his form of last season which seems like a stretch as this is pretty much how he has played his entire career, the team would be in a position to make a run. While the last 2 games have really not demonstrated it, offense is not the problem. Keeping the puck out of their own net is their downfall and it is a very steep drop. The problem is the Hawks don’t really have any pieces to trade for the help that they need which is probably why Campoli’s name is now being thrown around. Stan needs to get busy during this break and get a deal done before this road trip otherwise I believe we will all be looking forward to next years team much sooner than we anticipated. LOL. What? Campoli? Who said that? I honestly don’t have any idea what value draft picks have in this trade deadline game. Also, do we have any extra picks from prior trades i.e Byfuglien. I would like to trade draft picks for immediate help and hang on to our top prospects, but I don’t know if that’s realistic. I hope I’m wrong, but I am concerned that we would have been better off keeping last years team intact and developing younger players to fill in. We have three defensemen who belong in the third pairing and only one for the second pairing. I don’t know how much Campbell would help. We need a physical D-man to pair with Leddy. Are there any physical D-men who would be available? I’m thinking along the lines of a Weber or Seabrook type, but I also think that Bowman might not give up what is needed to get them. I don’t want to sell the farm, but you have to give up something to get something…or this is going to be a lost year. Hal Gill is a good D-man and is available but he’s probably another 3rd pairing. He’d be good with Leddy. Montador is supposed to be in the 2nd pairing but plays better with 10-12 minutes icetime.. I think people underestimate how good we were at the end of last year. It is very difficult to beat any good team 4 times in a row. We beat Vancouver three times and took them to OT on their ice in the last game. Once we had our full team(bolland) and had our legs set (we had to push to the limit to get in to the playoffs) I think we had Vancouver’s number and they went to the finals. Even though our points are higher I feel like were a slower and less skilled team in comparison to the end of last years playoffs. Im thinking we would have been better just keeping the team we had and then bringing up and developing the young guys. Mayers was the only good addition as far as I can tell. Of course, if Bowman pulls off a good deal or two without giving up our core then I am wrong and I hope I am. Bulk up the D a little more by dumping Bickell and Scott – they are both useless goons. Trade deadline is fast approaching. Crawford needs to work with Stephane Waite intensely during the All-Star break to work on better puck control and allow fewer rebounds. He has been letting too many soft goals in. Last nights first 2 goals, he was too far out of his net, yet had clear sight of the puck so he should have stopped them even though the D didn’t do a good job, defensively. The more I read, the more I lean towards the idea that dealing Kane might be the best thing for us. Buffalo is starving for Goals, and if we can pry away Myers, it might be worth it. It would give us a big body for the second D paring ( and a long term first pairing guy ). If we can aquire a forward in the package too (might have to give up bickell and a guy like beach) then even better. I mean would anyone here be mad at a Kane, Bickell, Beach, *pick for Pommiville, Myers trade? I dont prefer to lose Kane, but it solves the issue on D, and at full strength we would have (Toews, Hossa, Stalberg) on one line and (Sharp, Shaw, Pom) on the other. Then we still have Bolland, Hayes, Mayers, Brunette, Frolik, Smith in some compination on the back end. 3rd pair of D is old & slow. It’s killing us and making the 1st and 2nd units spend way too much time on the ice. Bowman needs to make a move and pick up a quality, physical D-man sooner rather than later. We could be the 8th seed by the trade deadline……..
Montador/OD/Scott should be rotating at #6. Until that happens we are in trouble. The question is how much of our future do we have to give up to get there? Nobody, in their right mind, thinks the Hawks would move Kane in-season while having a down year. Whether or not he finishes his career, or this contract, might have some wiggle room for discussion, but trading Kane today is without question the most ludicrious idea possible. to Tim’s comments: what you have proposed makes Bob Pulford look like the greatest GM in the history of professional sports. You would trade Kane, Bickell, Beach (who’s been hurt all year and is still injured fwiw) AND a pick for Brad Boyes and Tyler Myers? Helen Keller thinks that’s a laughably terrible idea. letting go of Soupy was a mistake so far… but Bowman still has money to spend so we will see where that Money goes before we beat on JR! Problem is there are not enough sellers in the market now. I know this is going to sound negative… but if the Hawks have a terrible start in February- they should be the SELLERS! I just don’t see this team winning a cup this year- Hawks would be better off as a Seller of a Frolik or #4 or Kane even— and building Cap Space and room for younger talent next year! Hey Pete? Do you strill want the same salary cap problems if Campbell weren’t traded? Thanks for the article Tab. Reality is communicating loudly with us concerning the Blackhawks, and the fact is, we are a slightly above average NHL team that plays above it’s head because of 3 outstanding 2 way players: Toews, Hossa and Sharp. The good news is, that most teams in the NHL are average at best, with only a handful standing out (unfortunately, most are in our division). Take any one or two of our big 3 away, and quickly we look like a young hockey team trying to compete against big brother, as you suggested. Facts are facts…our Defence is BELOW average amongst NHL teams. Seabrook and Keith are very good together, but no longer elite. Hjarlmarsson and Leddy make a nice 5-6 combo (right now), but not a 3/4…O’Donnell should only be filling in when it is an emergency, and Montador is clearly not the player the Hawks thought he was when they committed almost $3 million a year. The fact of the matter is, we MUST have a true #3 DMan to solidify Hammer, and allow Leddy to slide down to the 3rd pairing…for now. I have no doubt that Leddy will become an outstanding offensive defenceman and serviceable in his own zone, but he is struggling with it right now, playing over 24 minutes a game, often facing the oppositions top forwards. Offensively, we need a true #2 Centre…will Kruger become this someday? Maybe, but he simply doesn’t have the necessary offensive portion of his game right now to play with the likes of Sharp and Hossa…it is ridiculous that those 2 snipers are playing with him, as he simply isn’t close to their league. Now, I like Kruger a lot, and he is the younger, potentially stronger, and certainly cheaper version of Dave Bolland. So moving forward, Kruger is likely our #3 centre. So, Bolland either needs to elevate his game to a 2nd level centre, as he is currently showing he can, or really he is an expensive option as the 3rd line centre that we can fill for a lot less. I think that Bolland can be that #2 guy right now. Playing most of the year with 2 guys that couldn’t hit an open net if they were in it (Bickell and Frolik), he has put up very good numbers, and those would be a lot higher had he been skating with Hoss and Sharpie all year. The question becomes, can Kruger become the #3 centre now…and I think the answer is yes. Give him Hayes and Frolik, or Hayes and Shaw and that will be an effective checking/antagonizing line come playoffs. The fourth group, built around Mayers is just fine. So really, with the trade market as difficult as it is right now, Bowman really only needs to get that true #3 defenceman (easier said than done), but at least it is one guy. And then you hope that Emery continues to role into the #1 spot as CC finds his confidence once again. The 3rd line is young, but fast, gutsy and talented. I think this is a better option than giving away major pieces of our future for an expensive 2nd line Centreman that might only be here part of one season. @Brad – the organization has tried for a couple years to make Bolland into a 2C and it’s failed, but he’s showing the ability to be that guy since Sharp went down. I wouldn’t mind seeing the top six as you broke them down. However, I wouldn’t run out three rookies on the checking line. I would probably skate Shaw-Kruger-Brunette and then let Hayes run with Mayers & a whomever wants to be the 12th fwd on this team (I would lean towards Frolik). Well, at least Chicago isn’t getting spanked at the allstar break like Detroit is tonight. Montreal is now up 6-0 in the second period. OUCH! When do we start holding the coach accountable for this team consistently NOT being ready to play ? The Blues, Sharks, Preds and Wings-are rarely ill prepared . Q has a very talented team . Why can not get them ready to play . He always says ” we lacked compete level .” is it not his job to hold his players accountable ? I have thought he is the problem for the last 2 seasons . I am tired of seeing this team take off one or 2 periods almost every game . They do not look hungry to me . Time for a coaching change and the sooner the better . Watch the other tewams play and you’ll see its the same scenario with them especially Detroit lately. Babcock has been upset 3 of the last 5 games because of lack of compete level. San Jose has been sleeping off a period in many games too. The Preds…okay you got me there. Them and Pens got that lunchpail attitude but the top team is Detroit and they have the same problem you speak of. Dave I would rather have the salary cap problem and a better team than room under the salary cap and a worse team. The issue is whether Bowman can make the team better with the salary cap space. On that front my concern is that there are not enough teams looking like sellers and the vast majority of teams are buyers that are/will be crawling all over them. I have been reading about Anaheim and they just signed a top defender so they don’t look to be selling. What are draft picks worth in all this? Do we have any extra picks from prior trades? Anyone have any thoughts on that? Basically, we made our team worse from the end of last year and we hope to get better with the salary cap space at the trade deadline. Problem is most of the league is “buying”. So we could end up overpaying for average talent or getting nothing. We went from overpaying for a good player(Campbell) to overpaying for a below average player in Montador. I think Bowman is putting way too much stock in getting someone good at the trade deadline. And even if he does my concern is that it will cost too much. I hope I’m wrong. Bamford- I wasn’t suggesting giving all that for Boyes. I was suggesting that for Pom. when it went to boyes, obviously the deal would be reworked. probalby take out bickell. I really don’t get this obsession with trading Kane. He scored the winning goal in the stanley cup finals, he tied the game for team USA against Canada in the Olympics, he obviously has an extreme skill set and he’s young. Kane and Toews are untouchable. Pete: I believe all of the picks acquired from the post-Cup sell-off have been used. And I wholeheartedly disagree with your assessment that Bowman’s moves made the team worse this year than last season. Is this roster perfect? Absolutely not. But saying a fourth line with Mayers & Brunette is worse than the hot garbage we had running around last year isn’t reality. We can agree to disagree here, but i guess Im saying I would consider it. I love Kane. I think he is a tremendous talent and a great addition to the Hawks. I dont want him to leave. But If the “right” deal was there, yes I would have to entertain the idea. We would need to get atleast 2 players in return for him for it to be the right deal. Myers would fill a need, Pommiville fills a need. Im not a GM, so they would hash out details of the values of each of the those players, but that looks ok on paper. Beach to me is a throw in. We have Bickell, We have Hayes, We have Brunette in the short term. Beach offers nothing I’ve seen that those people are already doing. Granted since ive moved to Florida, I dont have a ton of access to the Hogs, but Beach doesnt greatly help us at this time in my opinion. If he gets a deal done I think he is expendable. Granted i just threw Buffalo has a trading partner. I wasnt saying that would be the best deal or one we should do without question. I was just using that as an example to get people thinking about the idea. Tab, generally what value to high draft picks have at the deadline. Also other than Mayers where’s the upgrade. Montador is not as good as Campbell. Carcillo wasn’t really an upgrade and I think Brunette is way too slow to be out there. I also don’t think OD is an upgrade over our defenders of last year. I still don’t know why Ben Eager was traded unless Atlanta wanted him as I see him as the same as Mayers. I am struggling to see the benefit of the offseason moves (other than Mayers) other than we save 4 million on the salary cap in exchange for a worse player. I don’t pretend to know everything, but what am I missing here. My basic thesis/concern is the team would have been better standing pat from last year and then bringing up the young guys. We could still have signed Mayers and now we wouldn’t be living or dying with the trade deadline.